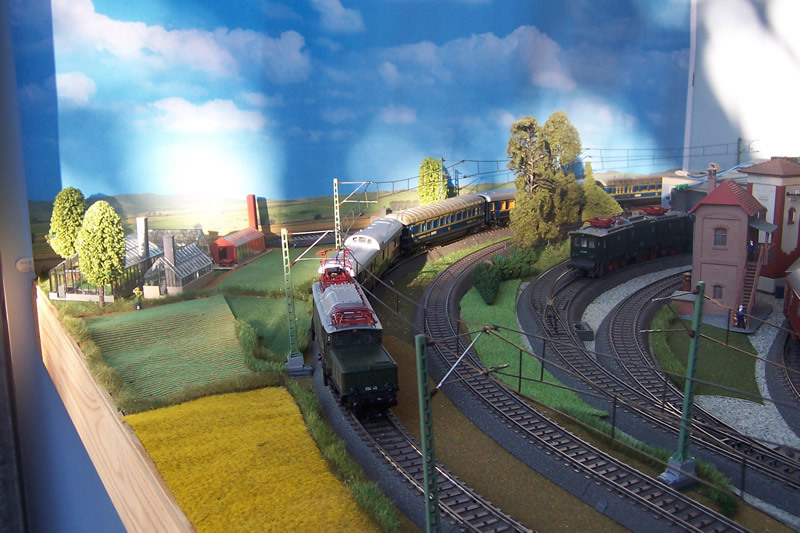 These photos of the Orient Express were taken on the Altkloster layout. It is early morning in 1949, somewhere east of Stuttgart. The Orient Express left Paris last evening, and the dining car was attached for breakfast in Kehl on the German side of the Rhine, opposite Strasbourg. The train will reach Vienna this evening. Sections of the train will travel further, as far as Istanbul. The engine is a very powerful German electric, an E94 first built in the 1930's generally for freight service. It was used to cope with very stiff gradients in that region, partcularly a long haul known as the Geislinger stage on the Orient Express route. Link to the history of the Orient Express.